What the hell! You'll need to take a look at this one folks. A Kinect controlled skateboard. Just when ya thought you've seen it all eh? Mounted to the front of the board, angled up towards the rider. The person being tracked can then control the speed and direction of the board. Practicle? meh. Awesome? Oh you better believe it! Developed by Chaotic Moon Labs, this all-terrain electric skateboard is definitely one of the coolest Kinect related projects to come out in a while. It's also no slouch clocking in at 32 MPH! You control the skateboard by initially raising your arms to get started. To move forward, simply push forward. You can slow down by pulling them back. For more check out the well made Kinect skater vid below. Chaotic Moon Labs' "Board of Awesomeness" is intended as a technology teaser to show how perceptive computing can turn around the way we look at user experiences. 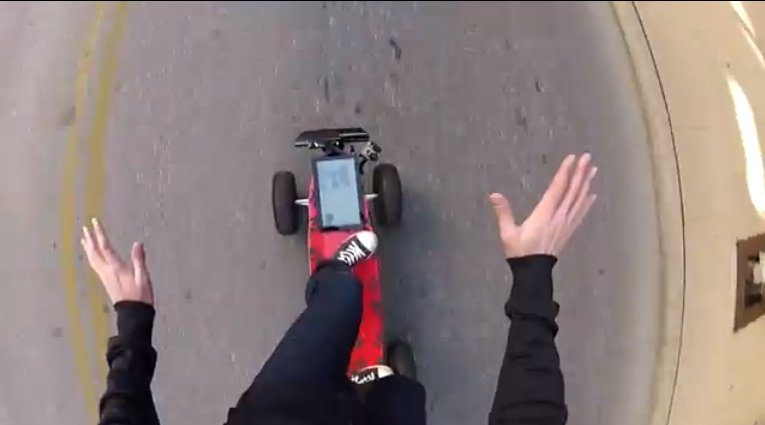 The project utilizes a Microsoft Kinect device, Samsung Windows 8 tablet, a motorized longboard, and some standard and custom hardware to create a longboard that watches the user to determine what to do rather than have the operator use a wired or wireless controller. The project uses video recognition, speech recognition, localization data, accelerometer data, and other factors to determine what the user wants to do and allows the board to follow the operators commands without additional aid.